Why, oh why traceth we the rays? Raytracing produces images ranging from snazzy to outright pixelrific, incorporating soft shadowing, indirect lighting, caustics, lens effects, etc., in a manner that is impossible to achieve in OpenGL. So why don't we raytrace everything? Raytracing is too slow to be performed in real-time on standard hardware, and the images it produces are fundamentally non-interactive. That is, one can't navigate or manipulate a raytraced image. Our project explores one compromise that allows the user to experience some interaction with a raytraced scene. We modified LRT (a raytracing package) to export geometry information with each pixel it generates. That is, in addition to outputting a .jpeg file, LRT now exports a file containing - for each i,j position in the final image - the (x,y,z) coordinates of the point in the scene that corresponds to that pixel. We will use this geometry information to render the raytraced image in OpenGL in a manner that allows us to move OpenGL objects around in the scene, and to haptically interact with the objects in the scene. 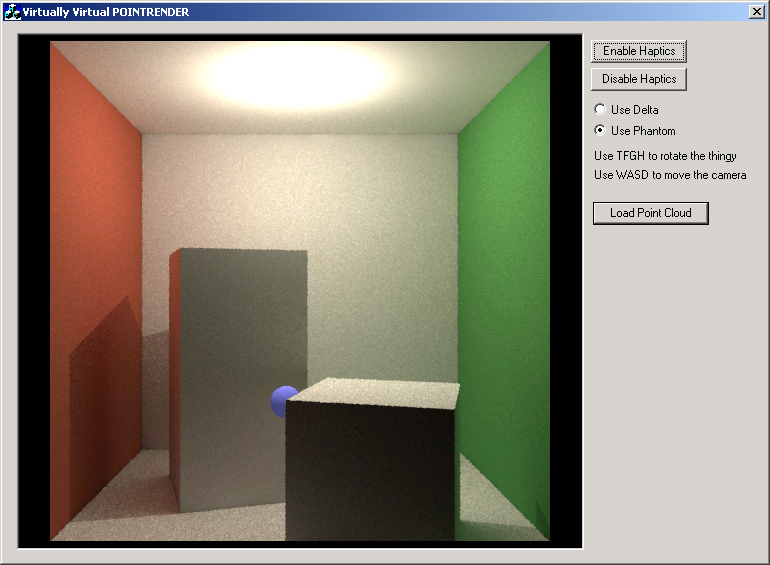 This screenshot shows the "Cornell box", a standard scene used for developing raytracing and radiosity algorithms. Note the soft shadows an indirect lighting... in other words, this was really raytraced, using a raytracing package (LRT) that we didn't write. What you can't tell yet is that this is not simply being rendered as a texture-mapped quad in OpenGL. It's actually a point cloud, with each pixel in the image being rendered as one GL_POINT. Because we're rendering with an orthographic camera, all the points line up (no perspective is applied). But if you could swing the camera out to one side of the box, you would see a cloud of points, spread out in the z-dimension. The perspective distortion applied to the ball is consistent with the perspective distortion visible in the raytraced scene. Note in particular that when the ball moves backwards along the side wall (which is perpendicular to the camera plane), its x-position follows the wall perfectly, which tells us that the perspective is lined up correctly. The trickiest problem was making the depth coordinates match up, so the ball would be occluded at the correct positions. The OpenGL depth buffer does not store "z coordinates" or "distance from the camera"; it typically stores a non-linear function of an object's position between the near and far clip planes. But this function depends on the projection matrix being used, so using a standard orthographic projection would not map our raytraced pixels to the same depth range as the one generated by the perspective transformation we're applying to the ball. So we rendered the point cloud with a hybrid projection matrix, effective applying a standard orthographic transform to x and y, but a perspective transform to z. The light source position is read from the scene file, so the lighting on the ball appears to come from the same light that illuminated the environment.